The Dim Sum Diaries | Liberty Private Works | "One cannot think well, love well, sleep well, if one has not dined well." Everyone is talking about Liberty Private Works. It’s one of those elusive restaurants where no matter how hard you try to get a booking, it always seems just that little bit out of reach. I have nearly been twice before, but for one reason or another something has come up and I haven’t been able to go. Such was nearly the case the third time. I had booked a table quite sporadically at the start of the year. One of those “hmmm where shall I book next?” moments that I seem to have a lot of these days (I blame all you hungry, demanding readers!). LPW only lets you book up to a month in advance and even then you can only try to get a booking and wait for a confirmation. I try never to fail at anything, and fortunately I received a congratulatory email announcing that my booking had been successful. Counting down the days, I waited in excitement. Until the day came and I received an ominous phone call from LPW asking if we could give up our seats to a couple who were celebrating their 30th wedding anniversary! Just before I started crying, they swiftly added that by doing so, I would be guaranteed a table any night I liked, AND have my wine costs covered for the evening. Now there’s offer I could not refuse! After waiting only a day longer than planned, I finally got to try the famous Liberty Private Works. My verdict: Amazing. 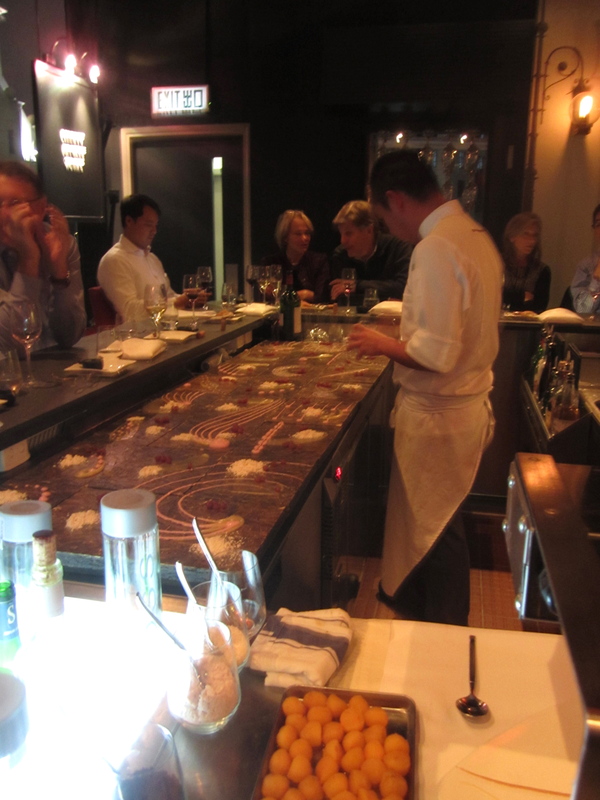 I know it’s only February, but I have already decided that LPW will be going on my top restaurants of 2012 list, similar to the post I did this year about 2011. The whole evening was an incredible experience, from the amuse bouche through the six savoury courses and onto the two desserts, the amount of passion and art that goes into every corner of every dish is unbelievable. There is no table seating at LPW; all the diners sit around the open kitchen, watching Chef Vicky Cheng and his team prepare their masterpieces. And by ‘masterpieces’, I truly mean ‘masterpieces’. Every dish is a piece of art. 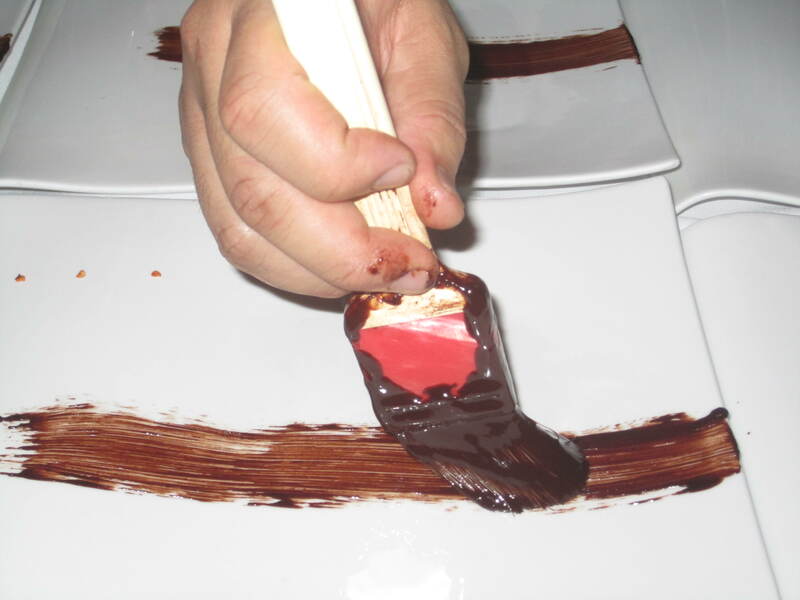 Herbs are positioned with tweezers; sauces are smeared onto plates with paintbrushes. There is not a single dish that did not leave me wowed. For fear of waffling, I will not describe every one of the nine courses and six wines we tasted (jealous?) but will entertain you with my absolute favourites, if it’s even possible to narrow it down. ‘Tuna, Esplette, Rice’, is one of Chef Vicky’s signature dishes – a form of tuna tartare, but a very special one, made with esplette pepper, puffed rice and beautifully adorned with gold leaf. Chef Vicky recommends you first eat the frozen blackberry, followed by the tuna and finish with the longan. I can understand why this dish remains a constant on the menu even when the others all change. 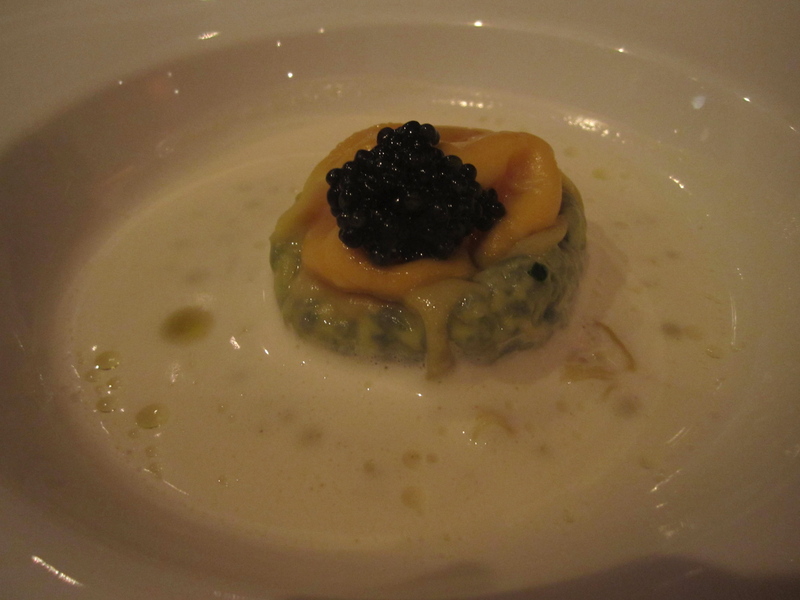 ‘Egg, Truffle, Parmesan, Caviar’, was another beauty. Within the ravioli lies a perfect soft egg; burst the egg, mix it with the caviar and creamy parmesan sauce and revel in the delicious flavours. 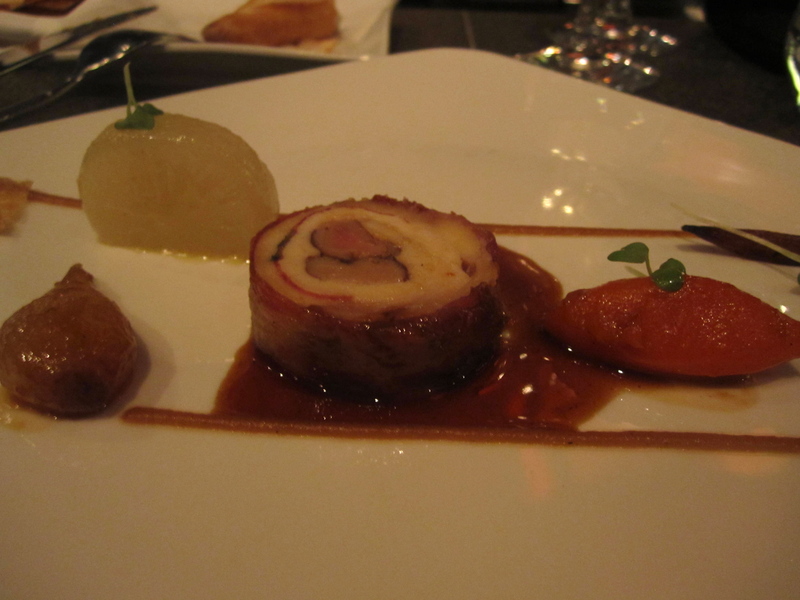 To follow a wonderful fish and gingerbread crumbs combo, came ‘Chicken, Foie Gras, Iberico Ham, Roots.’ Here the juicy chicken breast was wrapped around rich foie gras and blanketed in Iberico ham. 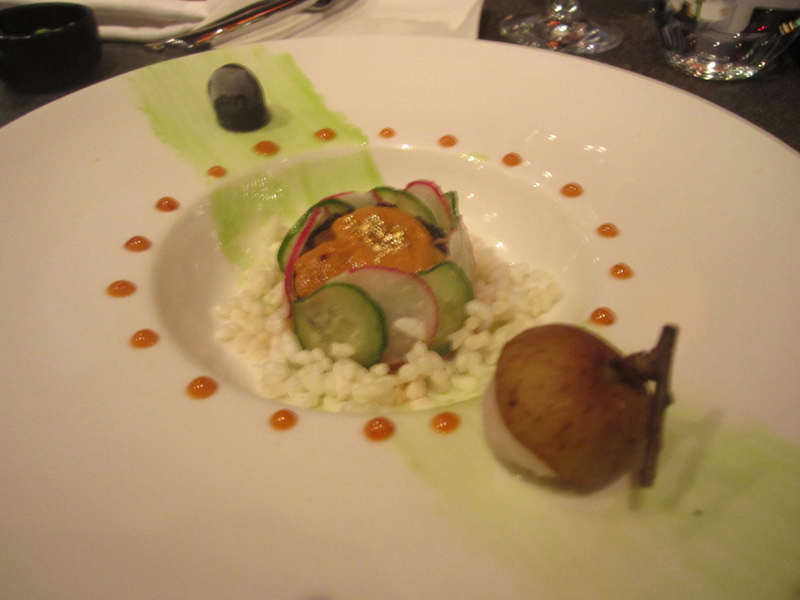 The balance between the textures and flavours, supported by the crunch of the root vegetables was divine. The final savoury dish was possibly the best dish of the night, ‘Lamb, Eggplant, Zucchini, Harissa.’ The lamb, done two ways, was heaven on a plate; firstly, lamb shank – beautifully flavoured, housed in a little cucumber shell, and secondly a delicious, tender, perfect medallion of lamb – utter bliss. Add aubergine and zucchini flower tempura to any already marvellous dish and you’ve won my heart. 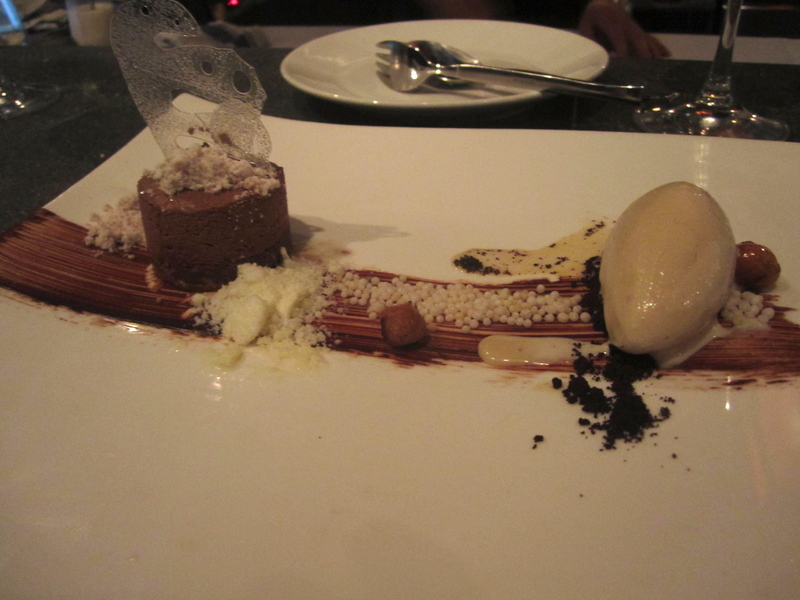 Whilst the first dessert was beautifully presented and unlike anything I’ve ever tasted, it was dessert number two which won me over (probably because I’m a hopeless chocoholic): ’Hazelnut, Chili, Earl Grey, White Chocolate’. We were advised to start with the tiny but mighty chilli seeds on the side of the plate, followed by the rest in any order we desired. Again, the medley of textures, from the light spongey pudding to the crispy puffed rice to the crunchy caramelised hazelnuts and creamy earl grey ice cream was a dream. 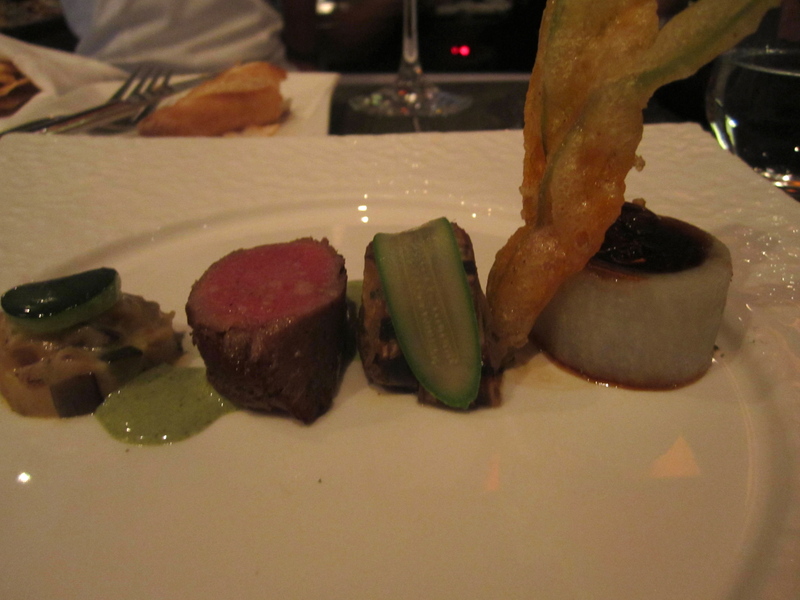 Of the nine dishes, six were beautifully paired with a range of incredible wines. My favourite wine accompanied my favourite dish: it was a 2002 Chateau Pontet-Canet Pauillac, a dark ruby, very smooth Bordeaux which enhanced the rich flavour of the lamb. The wine pairing normally costs $450 a head, so we were grateful that that couple had chosen to be wed exactly thirty years before. The nine-course feast will set you back $800 per person. Considering the quality of the food and the sheer passion and skill evident in every inch of every dish, I wouldn’t say this is completely unreasonable. In fact, I can think of many Hong Kong restaurants which charge close to this for substandard food. And I bet they don’t even present you with delicious freshly-baked madeleines at the end of the meal! My mouth is watering, Ale. Can’t wait to try it tomorrow night! Well done! It was AMAZING! We basically spent the entire night discussing who to bring with us on our next trip and what the occasion would be. Tonight we’re trying Davis. You’ll have to book through the restaurant. I don’t have anything to do with the restaurant and therefore cannot help with reservations. Sorry!